The Greenway Apartments are colorful, new one-bedroom apartments for rent. The apartments are centrally located in the Mid-City neighborhood, directly off the Lafitte Greenway in a converted industrial laundry building. The building offers unique vista views of downtown and is complemented on the ground floor by commercial tenants Hey! Cafe. Want to live here? Call 504-202-6736 to begin leasing today! Enjoy the best of city life within walking distance! You are walking distance to Whole Foods, Broad Theater, Bizou Wines & Tasting Room, the “Theater District” on upper Canal and only a bike ride away from the French Quarter, City Park, Bayou St. John and the Marigny! 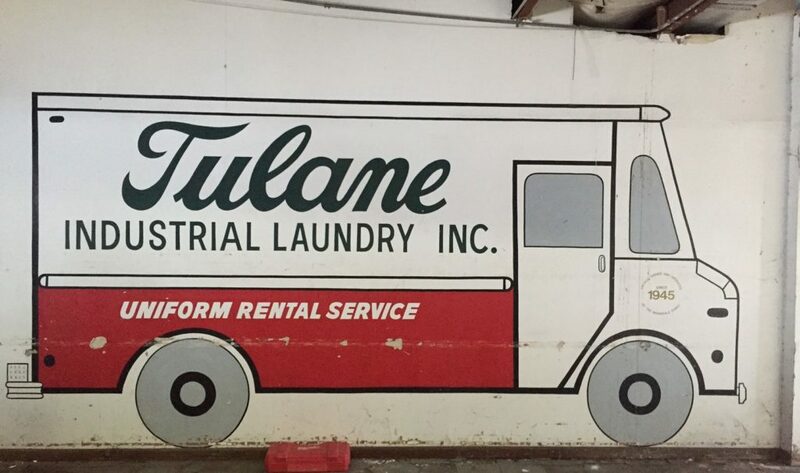 Built in 1940s by the Morreale family, the Tulane Industrial Laundry grew from a small shop to a quarter of a city block, eventually bringing together five buildings into one facility. Now, after ten years of vacancy, GCE Green Development is bringing this 32,000 square foot building back to life as a multipurpose residential and commercial space. We’re proud to contribute to the revitalization of the Lafitte Corridor as part of the Lafitte Greenway Cultural District and as a contributing member of the Mid-City Historic District. Read more about the building’s new life from the Preservation Resource Center and The Advocate. You can learn about the broader changes coming to the Greenway from NOLA.com.